Energy drinks have been linked to heart problems in a new study published April 26 in the Journal of the American Heart Association (JAMA). Oh, but it’s not the first time, not by a long shot. A 2013 study showed that energy drinks put an additional strain on the heart, causing it to contract more rapidly than usual. Over time, this can weaken the heart and cause palpitations. A November 2015 study revealed that consuming just 1 energy drink per day puts you at risk of heart attack and stroke because they cause harmful spikes in the ‘fight or flight’ hormone noradrenaline, as well as blood pressure. In March 2016, researchers warned that the sugary, uber-caffeinated beverages increase the risk of having an abnormal heart rhythm and can increase blood pressure, making the products especially dangerous for people who have preexisting heart conditions. It’s not just the caffeine that can cause the heart to go haywire, though. The vitamins, stimulants, and herbs in the drinks, combined with caffeine, super-charge your ticker in ways it can’t handle. Little is known about the safety of some of the other ingredients in energy drinks, so researchers decided to find out what kind of effect these components have on the heart. For the most recent study reported on in this piece, researchers compared physical changes in a group of 18 healthy men and women after they drank a commercially-available energy drink, and after they consumed another mixture containing the same amount of caffeine, but none of the other ingredients. The energy drinks used in the study contained 320 mg of caffeine (the amount found in 4 cups of coffee), 4 oz of sugar, several B vitamins, and a “proprietary” blend of taurine and other ingredients commonly found in drinks like Monster Energy, Red Bull, and 5-Hour Energy. Sachin A. Shah of David Grant Medical Center on Travis Air Force Base and University of the Pacific in Stockton, California, and colleagues measured the volunteers’ blood pressure and used an electrocardiogram (ECG, or sometimes called an EKG) to measure heart electrical activity for 24 hours after participants consumed the drinks. The authors point out that several drugs have been pulled from the market just for causing ECG changes of a similar magnitude. After consuming the energy drink, participants saw a nearly 5-point increase in blood pressure, compared with a 1-point increase after consuming the caffeine drink. The energy drink also caused the participants’ blood pressure to remain elevated for 6 hours. 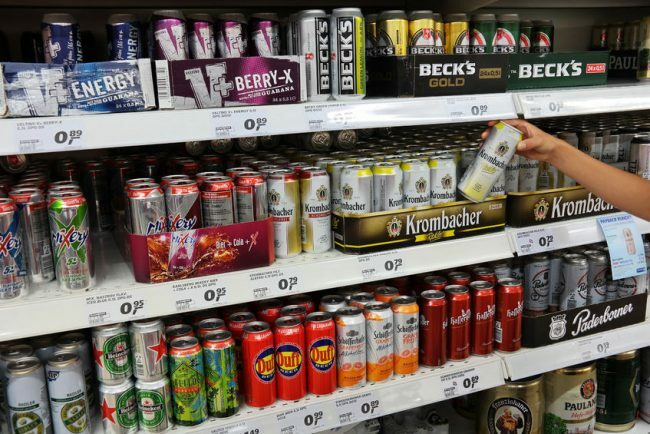 Aisle with a variety of energy drinks – Europe. If you’re a healthy person, those changes aren’t cause for concern. But if you have heart problems, you should steer clear of energy drinks. “The energy drink industry claims that their products are safe because they have no more caffeine than a premium coffee house coffee. 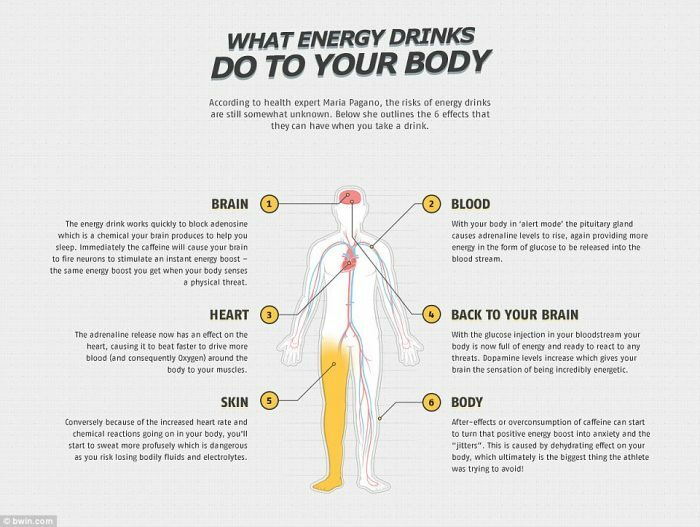 However, energy drinks also contain a proprietary ‘energy blend,’ which typically consists of stimulants and other additives. Some of these ingredients (including taurine and guarana) have not been FDA-approved as safe in the food supply, and few studies have tested the effects of caffeine consumption together with these ‘novelty’ ingredients. Between 2010-2013, the U.S. poison control center received more than 5,000 reports of people who got sick from energy drinks. Nearly half of those cases were in children who didn’t realize what they were drinking. The American Academy of Pediatrics says energy drinks have “no place” in the diet of children and adolescents.